The desserts designated for the first Cookbook Critique event were cakes from the second cookbook that I have for review. It's called Piece of Cake! by Camilla V. Saulsbury, and the recipes are all designed to be "one bowl, no fuss , from scratch cakes." In other words not to belabor the point, theoretically the recipes should be "a piece of cake" to make. But could they also satisfy the discerning palates of the SASSY foodies and cake-baking friends? The first part of the evening (The SASSY Club Tastes Tagines) was devoted to eating tagines and discussing the recipes from the Tagine cookbook. But after indulging in a plethora of tasty dishes, the SASSY cooks and their guests decided to let some time go by before tackling the arduous task of eating cake! So we enjoyed more wine and conversation while letting our food digest. After all we had to be able to taste each one of the cakes that were the dessert for the evening, and perhaps even taste them more than once! Although we had asked three of our "baker"guests to bake a cake each, one of our enthusiastic chefettes got a bit carried away and actually made two cakes. So all in all we had four different recipes on which to comment. Our first baker confessed to an addiction to salted caramelized nuts as well as chocolate, and appropriately picked the Salted Caramel Peanut and Chocolate Upside-Down Cake. She also decided to try the Raspberry Sour Cream Cake. Both of these recipes were from the So-Good Single-Decker and Loaf Cakes section of the book. As an experienced baker, she thought that the book would be easy to use by even a beginner baker. She liked the layout and found the instructions clear and simple to follow. The consensus of the cake eaters was that both cakes were very tasty. The only adverse comment from one guest was that the peanuts were too big and overwhelmed the look and taste of the chocolate cake. 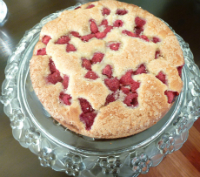 Two of the other recipes selected were from the section "Crowd-Pleasing Sheet Cakes." 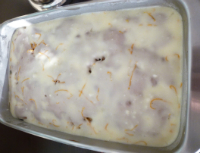 The Everyday Apple Cake with Lemon Icing was the choice of the guest who says she seldom bakes cakes. It appealed to her because of the fruit, and it looked simple to make. As a very health-conscious individual - she is a yoga teacher - she was concerned about the amount of sugar in the recipe. She also noted that in following the recipe for the lemon Icing recipe, a variation of the Vanilla Icing recipe, it did not say to sift the icing sugar, so that she ended up with some clumps of sugar in the otherwise smooth icing. The consensus was that the cake was moist and fluffy and delicious. It was certainly one of my favorites. The fourth cake was the Buttermilk Cake with Browned Butter Icing. This recipe was selected by one of our very experienced bakers because she is partial to browned butter icing. Her judgment was that this was a good book for a beginner baker but that there were tips that could improve the cakes. For example she felt that creaming the sugar and butter together first would have resulted in a cake that rose better. We asked our four male guests for their choices of best cake. Two picked the Apple Cake, one the Buttermilk Cake, one picked the Sour Cream Rasberry cake because it was the least sweet. 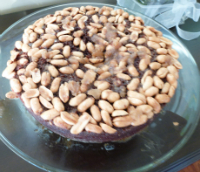 The two who picked the Apple Cake also chose the Chocolate Cake with the Salted Peanuts as a close runner-up and both agreed that had the nuts been smaller this cake might have been their first choice. I, who rarely eats cake or dessert, decided that this was the night to splurge and indulge. I had a piece of each of them and enjoyed every morsel. But I think the Apple with the Lemon Icing comes in as my number one. To the question of whether they would go out and buy this particular book, our two regular bakers thought probably not unless as a present for a beginner baker. However our Apple Cake baker gave it an enthusiastic thumbs up. Check out my book review at Piece of Cake! and see for yourself.